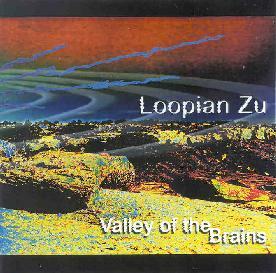 Loopian Zu - "Valley Of The Brains"
The cover art and name could lead you to believe this is some kind of electronica project, but they're actually a very talented five-piece (with occasional guests) who like to jam out live spacey improvised Ozrics/Gong fusion for an 8-13 minute stretch, often changing things up to avoid too much meandering, and the sound production is superb throughout. "Intelligence Park" is an intro piece, but a clever two-minute collage of tribal drums, didgeridoo and screaming jungle animals. The first song "Aquawalk" kicks off with a killer sax riff, reminiscent of Zappa or "21st Century Schizoid Man". Then the Ozrics comparisons become inevitable due to the twittery rushing space synth, rapid Ed Wynne-type picking and clean groove-based drumming. Half way through the synth-player is left alone to freak-out for a second, before the rest of the crew kicks in again with a hard-driving riff. An excellent comprovisition. "Git it Off My Chest" is a solid, funky fusion improv, where the piano and sax get particularly jazzy, and the drummer holds it all down very nicely, while still doing his own thing. "Absynthe" is a cool laid-back number, the guitar laying down a simple repeating reverberating bar for nice synth backdrops, some trippy sax and moody Orb-type vocal samples. "Dementalinger" is the first of several pieces that use vocals. The singing is melodic and fits in well, jamming along with the music in an improvised fashion, but the guy's voice isn't entirely inspiring at first, though there is a bit of Malcolm Mooney-ish playfulness later on that sounds better. Oh, and by the way - some more nice synth embellishment here! "Re-entry of the Cozminaut" starts off as another slow chill-piece, develops into a song with verse-and-chorus vocals, then half-way through becomes a freak-out with warbling synth, as the singer and another band member trade ground-control to space-traveller transmissions. "Spatiallure" is a shorter (six-minute) number... warm smokey-room baritone-sax sounds... spacey... but the mood combined with the tempo kinda puts me to sleep! "There is a Massive Mess of Moosh Mounding in My Mental Membrane, Motha!" is one of the more psychedelic work-outs, a long freaky improv with more quirky Ozric/zoo-type synth effects, and some great guitar oscillations. This whole disc doesn't always succeed in holding my attention (well, it is over 78 minutes), and the slower riffs are of the type that bore me a bit sometimes, but this is a strong debut that lots of folks will scarf entirely with glee. For more information you can visit the Loopian Zu web site at: http://www.loopianzu.com. Valley Of The Brains is available for $15 (postage included) from Brian Epley; 145 Avenue E; Billings, MT 59101.